A technician and a farmer are pictured on a genetically modified corn crop in Dong Thap Province, located in southern Vietnam. Vietnamese consumers may have been using genetically modified (GM) food for years without the knowledge of their real origin. 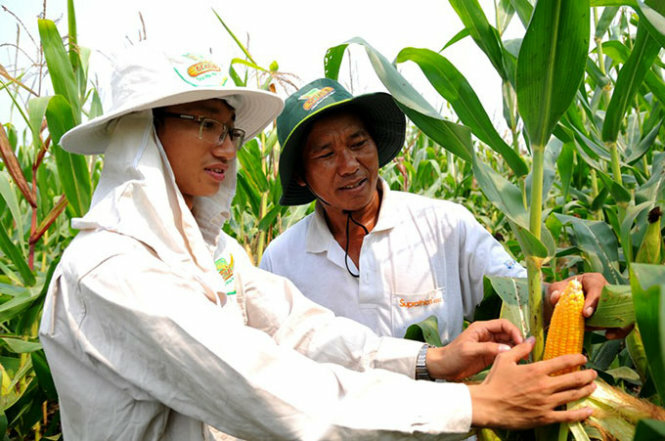 While Vietnamese scientists and experts are concerned over the licensing of the commercialization of genetically modified (GM) corn in the country, local consumers are worried about the health as whether a food is genetifcally modified or not is not made clear on the product packaging or label. Hoang Thu Trang has decided to stop buying soya milk from her favorite store in District 7, Ho Chi Minh City, following unverified report that soybean imported from the U.S. to Vietnam are GM food. “I’m not sure if they really produce the milk from U.S. soybean, but I have to stop [using them] just in case,” the District 1 resident said. Trang has even a bigger worry that the cooking oil she is using too is made from the GM soybean. “Then I will not know what alternative to use,” she said. Many Vietnamese food importers said they only inspect the safety and quality of the imported food, rather than paying any attention to whether they are genetically modified or not to place the GMO labels on them. Vietnam imported 3.5 million metric tons of dried soybean meal, 1.5 tons of soybeans, and 4.8 million tons of corn in 2014, said Le Ba Lich, chairman of the country’s animal feed association. The corn and soybean meal were used to produce feed for livestock aquatic animals, whereas the soybeans was turned into different food such as cooking oil, soybean milk, and tofu, Lich added. “Most of the soybeans from the U.S. and Argentina are GM and Vietnam has been importing for decades,” he said. Lich added that the Ministry of Agriculture and Rural once suggested putting the GMO labels on these products, but the proposal has never come to life. The director of an animal feed material importer admitted that he has never checked the GM origin of his imports. “We sell the corn and soybean meal to companies but do not know what they do with the materials,” he said on condition of anonymity. To date, some 29 countries have licensed GM crops, whereas around 100 nations allow the consumption of GM food under strict requirement on labeling. At many countries, a product must bear the GM label when at least 5 percent of its content has a genetically modified origin. But it is not the case in Vietnam. “We are completing the regulations on the management and labeling of GM food,” said Nguyen Thi Thanh Thuy, head of the technology department under the agriculture ministry. Some local businesses have taken action before an official regulaton is put in place. Ngo Van Tu, managing director of soya milk maker Vinasoy, said the company uses 80 to 90 percent of local raw materials for production, and only imports the remaining from Canada. “All of the import batches must obtain certificate saying that they are not GM food,” Tu said. Vinamilk, Vietnam’s largest dairy producer, also carefully selects the sources of their raw material imports. “The imported soybean must pass GM origin checks by Vietnamese authorities before we take them,” said Do Thanh Tuan, head of public relations with Vinamilk.